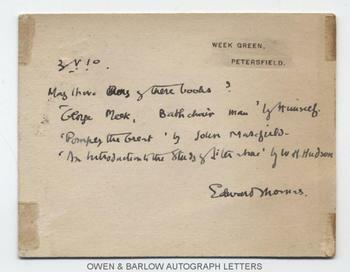 EDWARD THOMAS autograph Note Signed. Philip Edward Thomas. British (Anglo-Welsh) poet. Killed at the Battle of Arras in 1917. 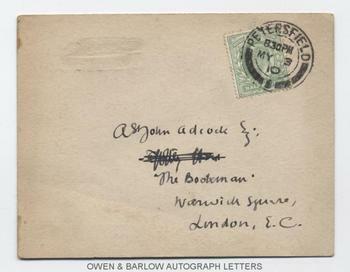 ANS on post-card. Week Green, Petersfield. 3rd May 1910. To A[rthur] St John Adcock. "May I have copies of these books? 'George Meek, Bathchair Man' by Himself. 'Pompey the Great' by John Masefield. 'An Introduction to the Study of Literature' by W.H. Hudson. Edward Thomas". Post-card measures approx. 4.5 x 3.5 inches. Mounting traces to corners. VG. Edward Thomas was working as a literary critic for the Daily Chronicle. He did not become a poet until 1914 and was killed at the Battle of Arras, shortly after enlisting in the Artist's Rifles in 1917. His fame as a poet was largely posthumous and this, coupled with his relatively early death, makes his autograph rather scarce. Edward Thomas befriended the Welsh tramp poet, W.H. Davies, to whom he rented a small cottage near to his house, and it was Thomas who did much to develop Davies's career. Arthur St John Adcock was an author and for many years was editor of 'The Bookman'. Adcock is principally remembered as the man who "discovered" W.H. Davies and it is interesting that he was here corresponding with Edward Thomas at around the time that Edward Thomas was also assisting him. Although Edward Thomas is commonly considered as one of the 'war poets' his range was much wider than that and he is regarded by many as one of the finest poets of his generation. His death was commemorated by W.H. Davies in his poem 'Killed in Action (Edward Thomas)' 1918. Thomas is buried in poets corner, Westminster Abbey.